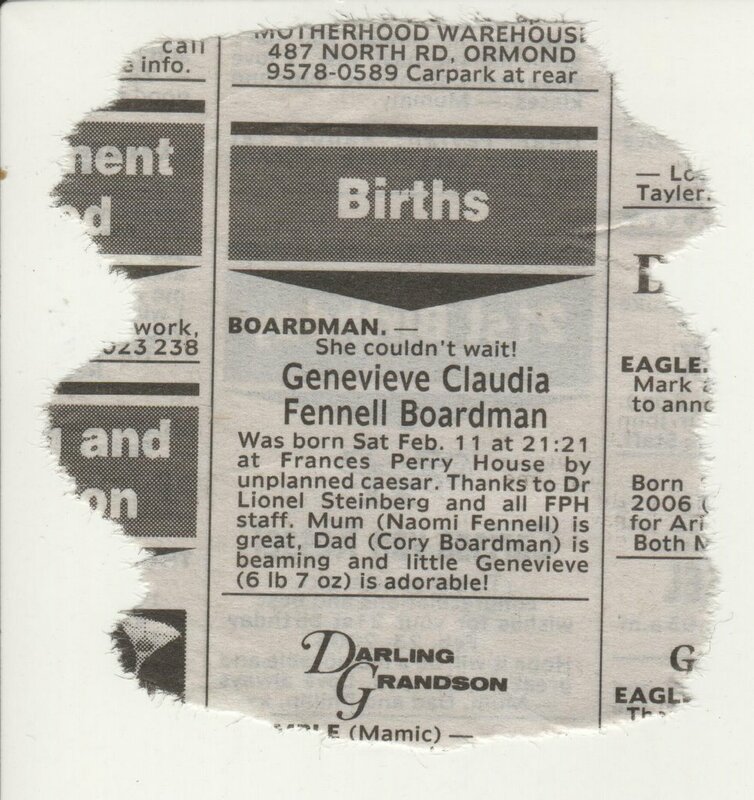 Back in the day, you let the masses know about your fresh kid via the newspaper classifieds. Now although we did eventually get around to putting one in the paper, it was far more effective and far cheaper to SMS everyone in our phone contacts. Of course, it didn't help that the first SMS went out after a very long day, so Daddy managed to spell her name incorrectly. On the plus side, the next day, people who we knew had photo-capable phones got a photo too! 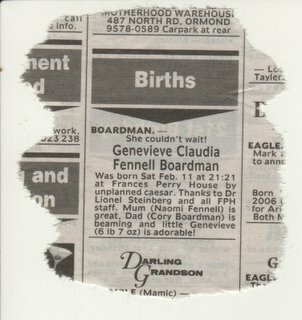 Thelma (who is Nanna) - Congratulations 2 Mum and Dad. Cant wait 2 c her. Boardy would like 2nd name. He he. Try and have a good sleep. Jane Salmon - Many congrats! Hope all family is well. Lovely name. Call me tomorrow. Tania - Oh my god! Congratulations! How is mom and baby doing? Iain - Congratulations! Hope this isn't a taste of things to come! Very happy for all 3 of you! James McIlvena - Congratulations Mum. I'm sure you, Cory and Genevieve will all get along beautifully. She will love her sleep and crying will be too much effort. Sally - Fantastic news. Hope to see you all soon. Leanne Kerr - Congratulations to you both. Great news! Matt Baird - Congratulations mate...just heard the good news! Andrea Athanaileas - She is gorgeous! Mick Leyden - Hey mate congrats on The happy news hope Nai and bub are well! Jamie Leathem - Congratulations, that is fantastic, only who is this? Cheers Jamie. Ken Kroeger - Congratulations - I was out of range over the weekend. I hope that all went well. Sorry if we missed anyone there - but as you can see, we did receive quite a few. Our phones filled up pretty quickly! And of course, there were plenty of old-school phone calls, and even older-school visits as well. A big thanks to everyone!